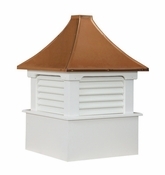 Morton roof cupolas are simple and chic. They’re ideal for homes, retail shops and just about any other structure that needs a little extra style. These louvered roof cupolas, part of Ridge Craft’s Select Series, are available in several sizes through Millworkcity; whether you need a small one for a cozy home or several large ones for an expansive commercial space, you’ll find what you’re looking for here. At Millworkcity, it’s our goal to help you complete your project under budget with high-quality products like Morton roof cupolas. These clean-lined louvered cupolas are affordable, durable and reliable. With square bases designed to accommodate up to a 10/12 roof pitch, they’re ideal for traditional buildings; extenders are available for different pitches. 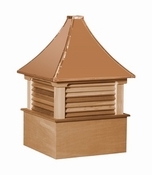 Because they’re made from a premium grade of primed white pine or white vinyl and topped with heavy-duty copper, you’ll enjoy these cupolas for years to come.